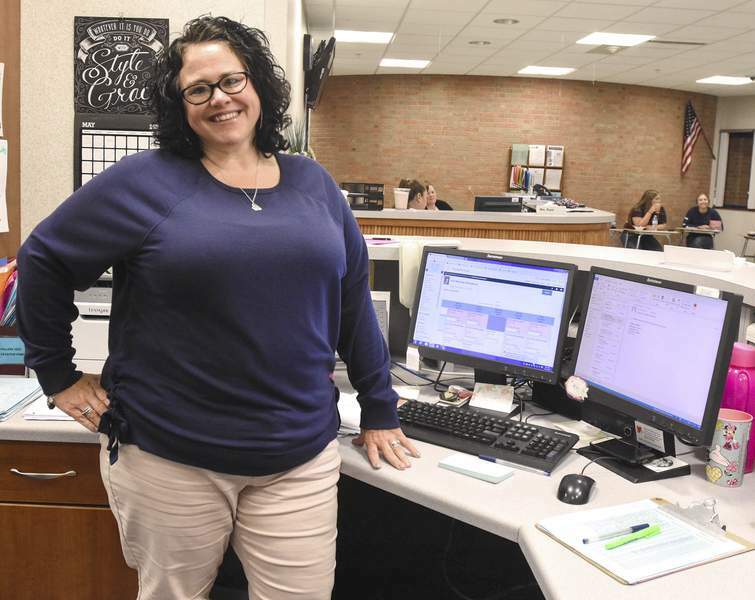 Michelle Davies | The Journal Gazette Carroll High School attendance secretary Kim Watkins has been at her position for 3 years. Kim Watkins' title is attendance secretary, but she's put her own stamp on the job she does at Northwest Allen County Schools' Carroll High School. Sure, there's the typical stuff – handing out passes, keeping track of students' early-dismissal requests, entering the names of absent students into the school's computerized tracking system. All those things need to be done for a smoothly running school with about 1,800 students in grades 10 through 12. But Watkins, 47, also takes a long view of her work. It's all about student safety and morale. But that doesn't mean Watkins has to be, well, mean about it. Usually, she said an unexplained absence results from an oversleeping teen or a busy parent who forgets to call in. So, Watkins said, she tries to keep an open mind – and an open door. “I think what makes me good at my job is that I just befriend them and get to know students on a personal level,” she said. By accounts, it's working. Kristen Lewis of the Allen County Sheriff's Department, Carroll's school resource officer, said her colleague is keyed in to students' emotions. Maybe it's because Watkins is a mom of three boys, one in early adulthood and two teens. Recently, Lewis said, Watkins noticed a student who seemed down, and the student acknowledged feeling depressed. The student was referred to medical help and able to get treatment. Langston Ginder, 18, of Fort Wayne said he got to know Watkins when she was a lunch server at Maple Creek Middle School. He got to know her better when he was paired with her youngest son, Carroll freshman Gavin Watkins, in Champions Together, which connects student-athletes with athletes with special needs. That's when he learned his friend's mom was battling breast cancer. Since 2016, Watkins has had three surgeries, 17 rounds of chemotherapy and 33 radiation treatments. But she still came to her job and treated students kindly, Ginder said. “I could see she was in pain sometimes, but she would never let the circumstances of the cancer affect the way she treated others,” he said.